We start by evaluating your space in your home. Our design professional will work with you to provide a design and layout that maximizes the look and functionality of your entire bathroom. Because of our expertise, we can offer design ideas and dramatic touches others simply never consider. Frameless glass shower doors have become GlassWorks most popular style of glass shower enclosure. The clean, minimalist aesthetics of frameless shower doors make any bathroom feel larger, more open, and brighter. The ability to customize when working with frameless glass shower doors and glass shower enclosures offer more flexibility in shower design possibilities than mass-produced framed shower enclosures. Many of our GlassWorks clientele insist on frameless glass shower enclosures for their bathroom update projects. Frameless designs eliminate the bulky, cluttered look that can come with mass-produced or poorly-executed framed glass shower enclosure designs. Removing metal and rubber components open up the shower design, making for an airy feel and exposing the interest features of natural glass edges and angles. A frameless glass shower imparts a luxurious, high-end spa feel to the bathroom and can become the focal point of a beautiful contemporary design. Framed glass shower doors and enclosures feature aluminum or stainless steel channels running along the edges of the glass panels. Typically lined with rubber or silicone seal material, the channels secure the glass panels comprising the door and wall components of the shower enclosure. They also provide attachment points for mounting brackets, door hinges, handles, and other hardware. A frameless design does away with most or all metal. The use of 3/8 or 1/2-inch thick very strong tempered glass affords the structural support normally provided by metal components. The heavy glass is secured to walls, floor, or ceiling with systems of minimally-sized brackets or rails. Doors may be hinged or sliding; in either option, all metal hardware is designed to be non-intrusive, a contribution to rather than a detraction from the visual beauty of the door or enclosure. Frameless glass enclosure designs create shower spaces that have a strong visual impact. The glass panels seem to hang in the air, defying gravity. Unobstructed glass also allows for better appreciation of the beauty of tile and fixtures used in the shower space. Frameless designs offer the potential to create semi-freestanding enclosures that impart a feeling of open space and have a fascinating aquarium-like look. Enhanced Safety – By regulation, only tempered safety glass is used in glass shower doors and enclosures. The glass is thick enough to resist all but the heaviest impacts. The hazard of cuts and scrapes from edges and corners of metal work is almost entirely eliminated. The good visibility provided by the glass can also enhance bathing safety for small children, the elderly, and handicapped users. Easy cleaning and maintenance – Glass cleans up with a simple wipe and squeegee – no scrubbing is required. Minimizing the use of metal components eliminates cracks, seams, and ledges that collect grime and are difficult to clean. Glass is highly corrosion-proof and not affected by water and humidity. Protective coatings can be added to the glass for even easier cleaning and long-lasting beauty. Flexible application – A frameless shower enclosure can fit any bathroom space. Component panels can be manufactured to custom shapes and the exact dimensions required for nearly gap-free installation. Glass and hardware options are also more expansive with the limitations of framing removed. Easier repairs – Should damage occur to a glass shower door or enclosure, repair is generally a matter of sourcing and changing out an individual component. Mass-produced framed shower enclosures rarely offer the option of replacing a single part, and it is difficult for anyone but the original installer to identify the manufacturer. Also, the elimination of framing cuts down on the number of parts that could be at risk for wear or damage. 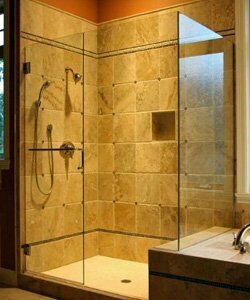 GlassWorks frameless glass shower doors and enclosures are constructed of high-quality materials to give years of service and exceptional performance. During the design process, homeowners engage in the hands-on selection of their favorite materials beginning with the glass:3/8” or 1/2” glass thickness provides necessary support and a substantial feel to the shower enclosure. Regular clear glass, ultra-clear low-iron glass, or tinted glass can be used to color-match and produce elegant effects. Guardian ShowerGuard glass manufactured and sealed with a patented ion-beam process to provide lifetime protection against corrosion and staining. Patterned, sand blasted, acid etched, or laminated glass options offer unlimited custom design potential and any degree of privacy desired. GlassWorks uses hardware specifically designed and engineered for our showers. Our size and buying power gives us access to the latest styles and finishes. Choose knobs, door pulls, and hinges in Polished Chrome, Oil Rubbed Bronze, Brushed Nickel, and Polished Nickel.